– Cla-Val to acquire HyDEC, exclusive sales agent for Cla-Val in No. California, No. Nevada and Utah since 1993. – Cla-Val announces the launch of our website for Latin America. Never miss another announcement from Cla-Val again! Follow us on LinkedIn, Twitter & Facebook and visit our website for any and all things Cla-Val! Turn your control valve into a meter in a matter of minutes! The Cla-Val X144 e-FlowMeter puts you on the fast track to getting flow information from control valves already installed in your pipeline. This compact, retrofittable insertion flow meter uses the vortex shedding method to measure flow. The meter is inserted into the inlet tapping of a Cla-Val control valve and oriented parallel to the direction of the flow through the valve. Flow enters the meter’s measurement cylinder where it encounters a bluff body, generating vortices. The vortices deflect off a piezoelectric sensor. The sensor then counts the vortices and communicates the data to the meter’s integral circuit board. The flow data signal is converted to a 4-20mA and communicated to a SCADA system or logging device. The X144 e-FlowMeter can be used in areas not normally suited for flow meters such as adjacent to pipe reducers and elbows, or downstream of a gate valve. Because it is installed in a control valve body tapping, down time is minimal and the presence of the flow meter does not impact the valve’s original function in the pipeline (for example: pressure reduction). In fact, the X144 e-FlowMeter can be installed in a matter of minutes. More than two-years in the making, the X144 e-FlowMeter was developed by Cla-Val’s own R&D teams in the US and Switzerland. The X144 was tested by two independent laboratories, Utah State University and Imperial College of London, and found to be accurate to within =/- 2% of full scale. The X144 e-FlowMeter has been on the market for about four years. Thousands of units are installed worldwide, providing accurate flow data to system operators who, in turn, use that data to diagnose shortcomings in performance, laying the groundwork for system optimization. An example of how our e-FlowMeter can used to identify problems in a waterworks distribution system is illustrated in the following case history about a recent installation in coastal Orange County. 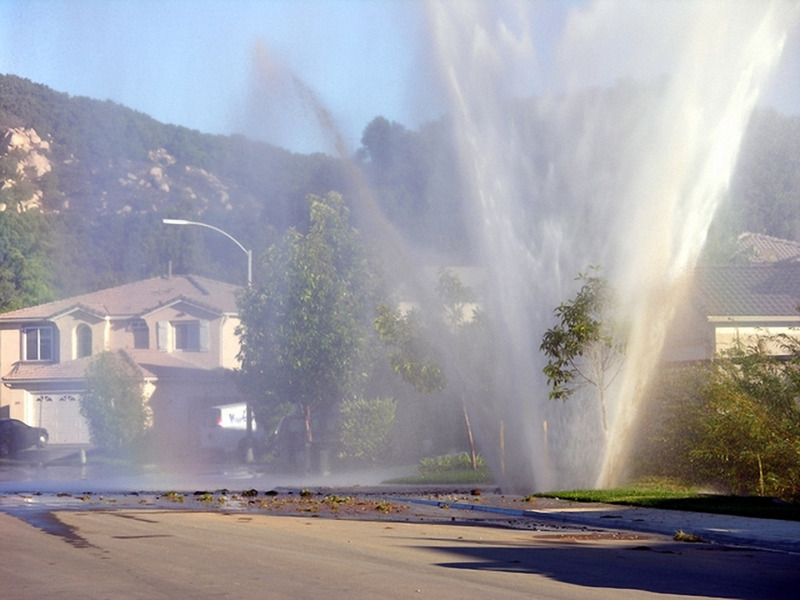 In this case, a water company in coastal Orange County struggled with water quality in a part of the community served by three pressure reducing valve (PRV) stations, but had not yet pinned down the source of the issue. The local Cla-Val Sales Engineer was consulted for possible solutions, and ultimately recommended that an X144 e-FlowMeter be installed in one of the three PRV stations to measure flow. After a short time in operation, e-FlowMeter readings showed that the PRV in that particular vault was not being opened as often as it needed to be for adequate flow to ensure acceptable water quality. The added bonus for this particular valve installation was that a Cla-Val X143IP Power Generator was installed to power the electronic flow meter and the CRD-33 Electronic Pilot Control, making this a true all-in-one valve solution. Armed with the information the X144 e-FlowMeter provided, the entire system was rebalanced to achieve the water company’s operational goals. After solving their water quality issues in the immediate area served by that PRV station, the water company determined that installing X144 e-FlowMeters at a majority of their PRV stations should become part of their standard operating procedure to deliver the water quality their customers expected and deserved. Whether there is a problem to be diagnosed, a desire for more information from a particular valve installation, or a need to communicate flow data to a SCADA system, the Cla-Val X144 e-FlowMeter is a cost-effective means to achieve those goals. Minimal down time, simple set-up, and highly accurate meter readings are the hallmarks of the X144. Watch an actual X144 e-FlowMeter being installed in a matter of minutes! 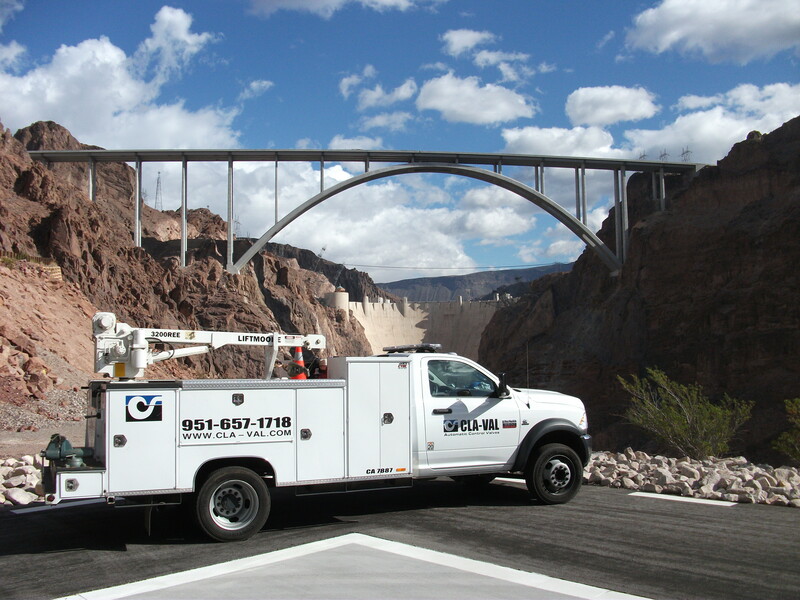 From the Hoover Dam to offshore oil platforms, high-rise buildings and waterworks systems throughout North America, Cla-Val Field Service provides expert on-site maintenance, repairs and start-up services for automatic control valve installations. Our technicians have even serviced Cla-Val products aboard US Navy ships and aircraft carriers. Cla-Val Field Service Technicians have an average of over 14 years of industry experience and all are confined-space certified. Their in depth knowledge of Cla-Val’s product line allows them to diagnose and resolve issues quickly, with minimal downtime. Cla-Val’s Field Service Technicians are also skilled troubleshooters who can assess and advise when the addition of ancillary products such as H-Style Pipeline Strainers, anti-cavitation trim or special stems can significantly extend the service life of a control valve and minimize easily preventable performance issues. Brand specific training is important, too. Having a field service technician who is well versed in the care and upkeep of Cla-Val control valves can make all the difference when an emergency repair is needed. Not only can Cla-Val trained technicians resolve current issues, they can also make recommendations for periodic maintenance tasks that prevent future problems from occurring. Our fleet of service vehicles, most equipped with cranes for heavy lifting, are fully stocked with every part for every type valve in all sizes up to 24-inches. Spare parts are readily available from the factory or at warehouses throughout the country. Each truck also has all the tools, both common and special, that are needed to service a valve. Cla-Val’s dedicated service centers in Southern California, Northern California and Elgin, Illinois, just outside of Chicago, are able to meet the service requirements in their immediate area and surrounding states. 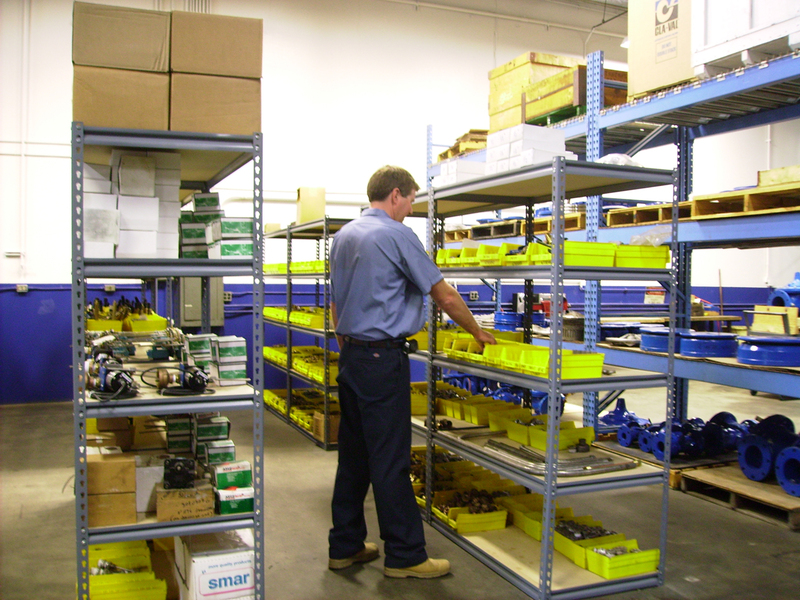 For service needs outside those regions, many of our factory authorized Sales Agents offer similar field services and a high level of expertise in servicing Cla-Val products, backed by the factory and a network of direct Cla-Val Salesmen and Sales Engineers throughout North America. We’ve worked hard to ensure that a field service solution is never more than a phone call away. What are the most common service issues in automatic control valves? Performing regular preventative maintenance can help ensure that your Cla-Val control valves operate for years with few or no issues. Annual inspections and cleaning of body ports, strainers, and stems should generally be enough to keep your valves operating smoothly. One of the most common service issues occurs when the pilot system strainers become plugged by mineral build-up or debris. The solution is simple: Periodically inspect and clean or change-out the strainer mesh. Using the correct strainer for the application is also important. 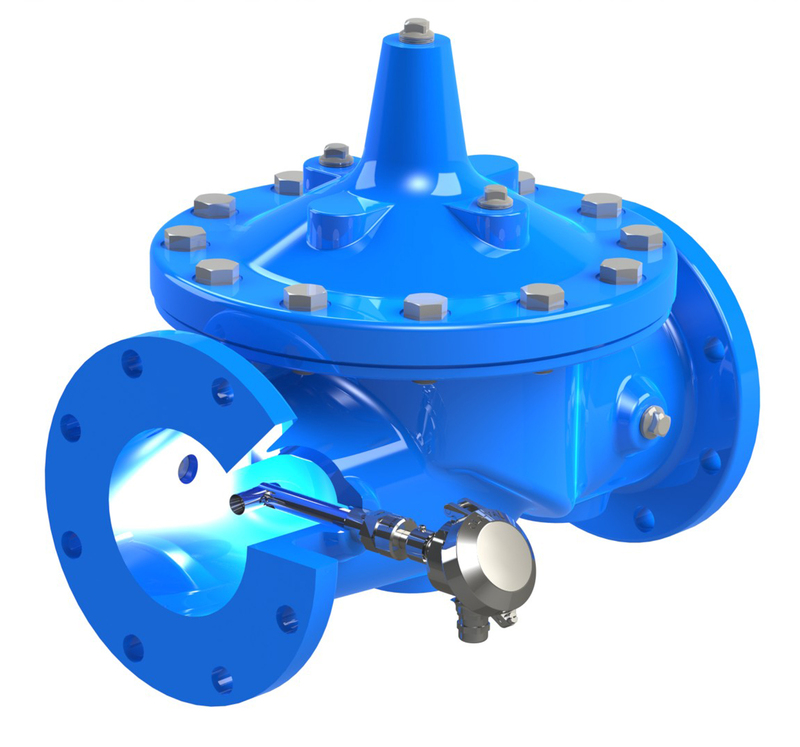 For systems where there is a potential for larger debris in the flow, an H-Style Pipeline Strainer is an ideal solution. 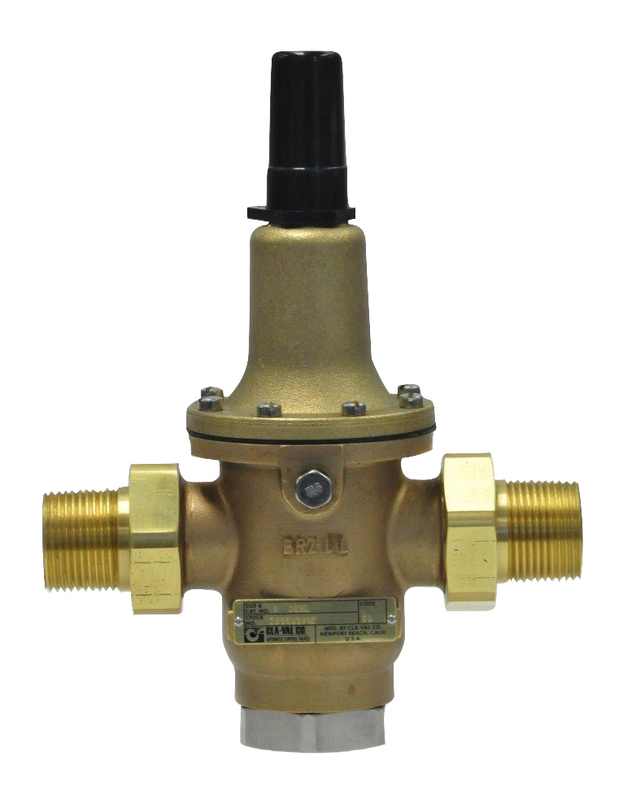 Installed upstream of a control valve, an H-Style Strainer is an especially beneficial preventative measure because it stops debris from reaching the valve and becoming lodged under the main valve stem, impacting valve operation or damaging internal components. There are a myriad of other preventative maintenance steps that can be taken to keep your control valves operating efficiently and ensure years of superior performance. When and if issues occur, enlisting the troubleshooting skills and expertise of a Cla-Val factory trained, factory-backed service technician will get your control valves back in tip-top condition and your distribution system running again at peak efficiency. What about the rubber components in my control valve? As a preventative measure, Cla-Val Automatic Control Valves should undergo a complete “rubber rebuild” every three years. This entails removing and replacing the diaphragm and disc in both the valve and its pilot control. In some cases, a complete rubber rebuild may be performed more frequently, either as preferred by the water company as a preventative measure, or by necessity in systems with exceptionally high pressure and flow or very harsh water. How do I contact the service center or service provider in my region? On call 24 hours a day, 7 days a week, 365 days per year, Cla-Val Field Service is there when you need it, backed by nearly 80 years of valve design and manufacturing experience. Visit our website at www.cla-val.com and click on Field Service Providers to locate the provider nearest you. In January 2014, Governor Jerry Brown declared a drought emergency for the State of California. Today, more than a year later, the drought has only gotten worse. According to California’s Bi-Weekly Drought Brief, January 2015 finished as one of the driest Januaries on record. Statewide, the snowpack is at 22% of what is considered normal for this time of year. Reservoir levels are at all time lows. The State Water Board recently issued warnings of widespread water curtailment mandates if dry conditions persist. On the positive side, Californians have made progress to save water, partially as a result of an awareness campaign called ”Save Our Water” launched by the State in 2014. The statewide appeal to reduce water consumption was particularly effective in Sacramento region where water usage was cut by nearly 20% in 2014. Organizations such as American Water Works Association and Water Environment Federation have also placed significant focus on conservation and sustainability as well as educating their constituents about best water management practices. Reducing consumption is obviously the best approach and the right thing to do, but there are other options that could be implemented by water companies that can have immediate and significant reduction results without relying on the actions of individual customers and businesses. One such approach is pressure management in waterworks distribution systems. In fact, pressure management has proven to be one of the key parameters that allow water distribution systems to proactively reduce water loss while operating in a way that doesn’t impact the system’s ability to serve the needs of the community. Too little pressure renders a system incapable of supplying the needs of customers and compromises water quality. In the worst-case scenario, not having enough pressure severely hampers the ability to deliver adequate flow for fire fighting (fire flow). Conversely, having too much pressure leaves a system vulnerable to pipe breaks and background leakage. In fact, small, undetected leaks often represent a higher proportion of water loss than larger reported leaks or pipe breaks. Many systems experience between 10 -20% of water loss through leakage. According to pipe industry research, “All told, leaking pipes lose some 2.6 trillion gallons of drinking water every year, or 17% of all water pumped in the United States. This also represents $4.1 billion in wasted electricity annually”. “Our water infrastructure is now in decline after decades of service. 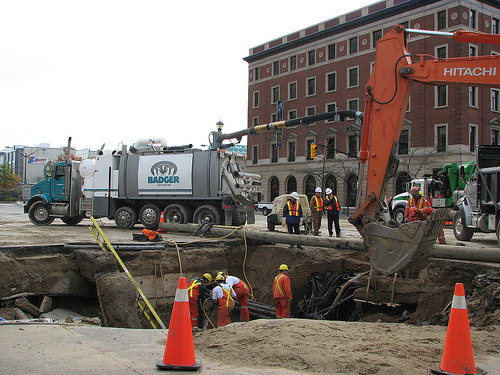 The signs of distress surface daily as water mains break, creating floods and sinkholes. The loss of water service is more than an inconvenience, since it causes significant social and economic disruptions and jeopardizes public health”. Everyone can agree that water loss through pipe breaks and insidious leakage is highly undesirable. It hurts people, damages property and becomes even more detrimental when coupled with drought conditions like those California is experiencing. Water loss is also very expensive. In a report published by the United States Environmental Protection Agency: Control and Mitigation of Drinking Water Losses In Distribution Systems, one Eastern US water utility’s value of water losses in one year topped $32 million. Other water companies throughout the US also reported value losses in the millions of dollars. All things considered, older pipelines are prime candidates for the implementation of active pressure management measures that can significantly reduce water losses caused pipe breaks and background leakage. Basic Hydraulic Pressure Reducing Valves (PRVs) are the workhorses of any water distribution system but they do not actively manage pressure. There are, however, enhanced pressure reducing valves available that can perform the functions of a traditional PRVs, as well as adjust pressure up or down based on actual demand. Advanced Hydraulic Pressure Reducing Valves reduce a higher inlet pressure to a usable outlet pressure based on flow utilizing a dual-stage pilot control with two pressure set points. As the demand decreases, the valve senses the decrease and reduces the pressure to the level necessary for current requirements, as opposed to continuing to maintain a pressure set point that is higher than what is actually needed and may ultimately cause leaks or pipe breaks. When demand returns to normal levels, pressure is increased to meet the heightened requirement. This “pressure on demand” or “active pressure management” capability keeps the system from being over-pressurized, while still ensuring adequate pressure for fire flow. In some cases, it is desirable to use an electronic control valve to handle pressure reducing requirements in a water distribution system. Electronic Pressure Reducing Valves have the capability of reducing the pressure in a system based on a flow/pressure profile that is loaded into an electronic controller, which in turn, monitors flow and pressure; adjusting the valve according to a set of rules established by the system operator. 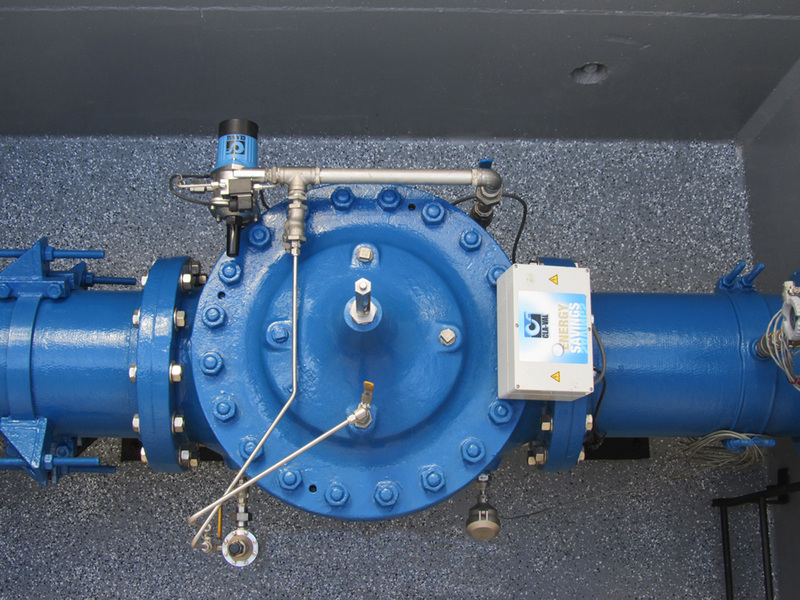 An Electronic Pressure Reducing Valve can be easily incorporated into water company SCADA control systems to allow remote adjustments to pipeline pressure levels to actively manage pressure. Throughout the waterworks industry, Cla-Val is known for its development of system optimization strategies using automatic control valves. For the past 30 years, Cla-Val has also provided an array of solutions to help reduce water consumption and loss through the use of control valve technology. Because of this, Cla-Val is the ideal partner for water companies seeking proactive means to conserve water and its pressure management products, the best means to bring water saving goals to fruition. Active Pressure Management is an obvious and simple way to prevent or minimize water loss. It has been successfully used in the United Kingdom, France and Australia for decades. Pressure Management is also quickly gaining acceptance through successful implementation across Latin America. Perhaps the time has come to use existing technology that is economical and easily accessible to do more to protect our dwindling water resources while we continue to deal with the drought that is plaguing the State of California. For a comprehensive overview of Cla-Val’s Pressure Management capabilities and water saving valves, visit http://www.cla-val.com/waterworks-pressure-management-c-1_5-l-en.html. One of the tallest buildings in the Los Angeles skyline had everything a tenant could dream of – – stunning views, lush interiors and a fantastic location in one of the most exciting cities in the US. It also had a noise problem emanating from its domestic water piping system and building inhabitants were not happy about it. The noise originated in the pressure reducing valves (PRVs) in the building’s water system and the fact that the original piping design included just one subterranean pump station to serve the entire building. 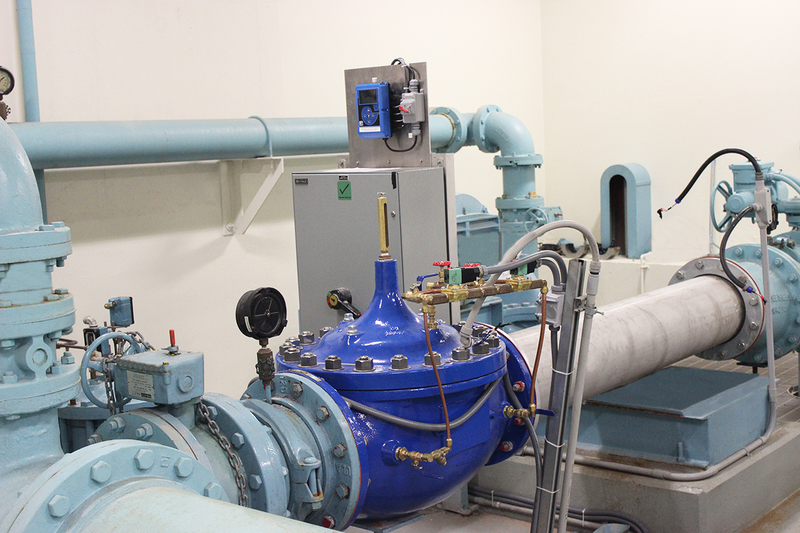 While having one primary pump station is fairly common for high-rise structures, in order for the building’s water system to effectively serve the upper floors, city supply pressure needed to be increased to 400 psi. This was done through a series of valve stations, each equipped with a set of two control valves. 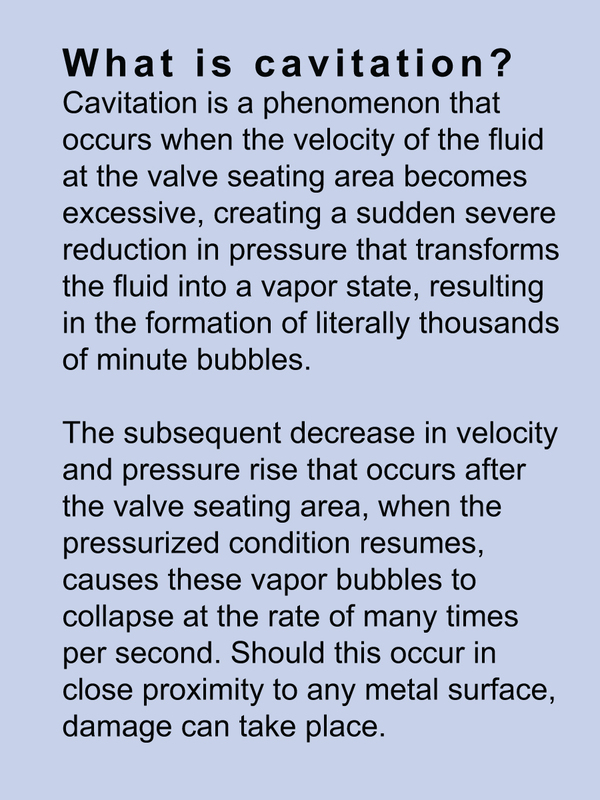 Because of high flow and pressure drop that occurred during pressure boosting, valve after valve was being “eaten up by cavitation”, creating significant noise in the process. Over the course of several years, the building’s PRVs had to be replaced multiple times due to the damaging effects of the cavitation. Unfortunately, replacing the valves did nothing to resolve the noise problem. Finally, after years of cavitation and noise issues, costly equipment replacement and growing tenant complaints, the building engineer turned to Cla-Val for help in resolving their problem. Short of completely redesigning the system to include a secondary pumping station (which would have been a logistical and financial nightmare), the Cla-Val District Sales Manager recommended that new stainless steel pressure reducing valves equipped with KO anti-cavitation trim be installed to address the issues they were facing. Within a month, the plumbing contractor installed a set of two stainless steel 90 series pressure reducing valves equipped with KO Anti-Cavitation trim in each of the high-rise building’s lower five valve stations. 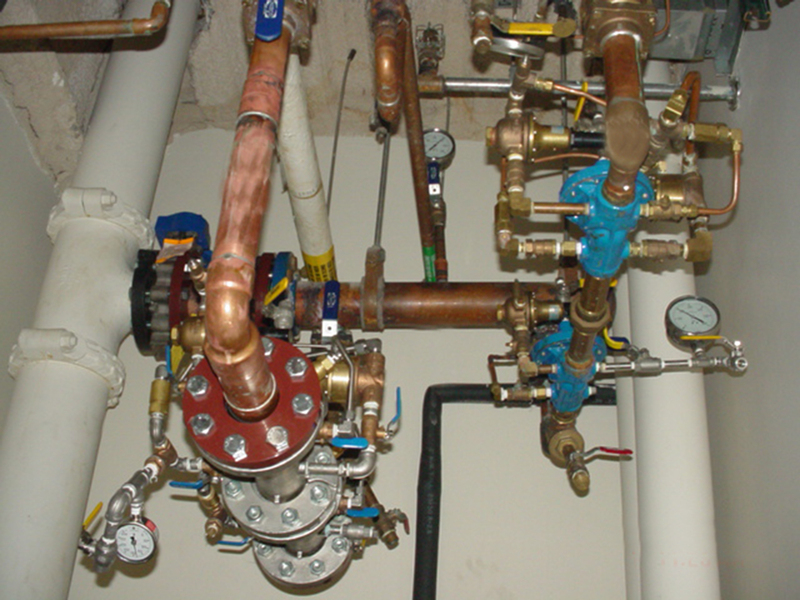 The existing pressure reducing valves at each station remained in the system to act as emergency bypass valves. Installation of Cla-Val KO anti-cavitation valves was a tightly orchestrated process that involved shutting the entire building down on a Friday night, isolating the water column, installing the valves and restarting the system before building tenants returned the following Monday. This quick installation process minimized impact to the building’s business operations. Initial results showed that the Cla-Val pressure reducing valves equipped with KO anti-cavitation not only operated accurately and efficiently, but also significantly reduced noise levels throughout the system. After achieving several months of dependable (and quiet!) service with the new PRV’s, the building engineer began replacing the remaining valves throughout the building with Cla-Val pressure reducing valves, equipped with KO trim. To learn more about cavitation and how to eliminate, visit http://www.cla-val.com/01ko-anti-cavitation-pressure-reducing-valve-p-18-l-en.html. Watch an animation showing how cavitation occurs and how it can be significantly reduced to prolong the life of valves, limiting noise and cavitation issues. When Cla-Val released the VC-22D Electronic Valve Controller, we knew it was a game-changer. We understood immediately that we had designed a product with immense potential. In one small device that you can easily hold in one hand, the ability to control a multitude of waterworks valve applications exists. Pressure Control with Upstream or Downstream Feedback, Flow Control with Mag Meter or Electronic Flow Meter; Modulating Level Control; Ratio Control; Altitude and Level Control; Logging; Pump Control and Pressure Management are a few of the more common applications the VC-22D can control. The VC-22D’s unique capabilities are made possible by built-in software – something we call ValveApps™, and some pretty powerful tuning capabilities. Simply put, the VC-22D turns a standard electronic control valve into an “all-knowing, all-seeing” smart valve. Working in conjunction with a SCADA system, it is a simple, easily deployed means to optimize waterworks system performance. The VC-22D is supplied with pre-loaded ValveApps™ for most common valve functions (mentioned above) and can enable a single valve to perform multiple functions. Custom ValvApps™ can be created to meet unique application requirements such as water conductivity or control of another type of valve, such as actuated butterfly or ball valves. During the development phase, customer input made it obvious that the most important characteristics of the new controller would need to be simple user interface and straightforward navigation…no programmers necessary! Cla-Val Engineers ultimately designed a controller with a long list of advantages. They created a product that acts as a hub for controlling valve functions and communication between SCADA and a suite of complementary components such as electronic pilots, flow meters, position transmitters, and other electronic devices. With the VC-22D, they bridged the gap between SCADA and a control valve in a way that has not been possible before. 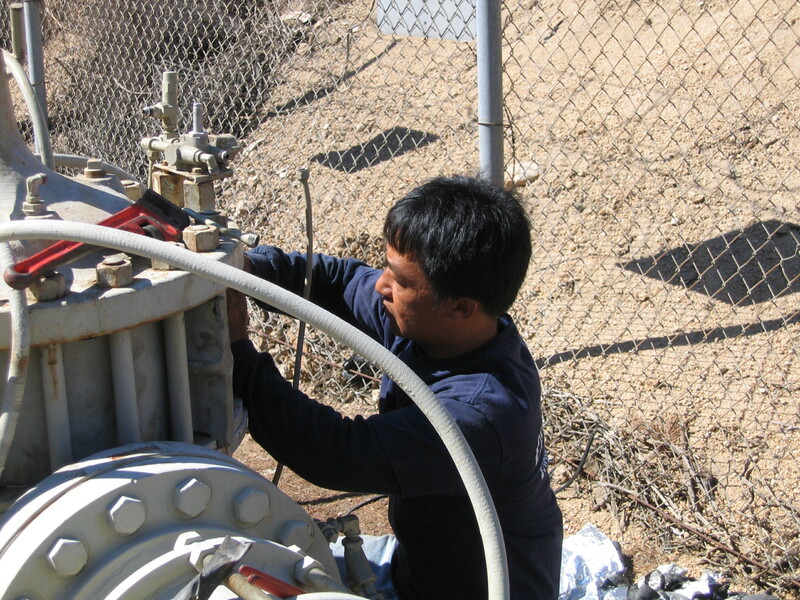 What if a valve installation doesn’t have power – can the VC-22D still be used? For valve installations without power, the Cla-Val X143IP Intermediate Power Generator can be installed in the control valve to use the hydraulic energy in the pipeline and an integral turbine to generate enough power to operate the VC-22D Valve Controller. The X143IP generates up to 14 watts power to operate electronic products in the near vicinity of the valve installation, including the VC-22D, electronically controlled pilots, electronic flow meters and communications equipment. The VC-22D is the culmination of 25+ years of experience in electronic valve control and nearly 80 years of designing and manufacturing automatic control valves. The VC-22 controller was developed by control valve experts who knew what its capabilities needed to be and what control valves are actually capable of beyond basic functions. Highly customized valve applications are now possible. The new valve controller is part of a growing line of electronic products (e-products) developed by Cla-Val to add capabilities and enhance the performance of automatic control valves. Other Cla-Val e-products include the X144 e-FlowMeter, 33 Series Electronically Actuated Pilot Controls, and the X145 Electronic Display, to name a few. There are distinct advantages in using Cla-Val’s suite of e-products versus a collection of electronic components that are not specifically designed to work in concert with one another. Cla-Val e-products are designed and manufactured by Cla-Val and we support what we sell. Phone calls to multiple component manufacturers are not necessary. Our expertise in developing control solutions for real-world valve applications is considerable and we are committed to continuous development of electronic products that further enhance control valve capabilities. Visit http://www.cla-val.com/electronic-products to learn more and see our complete range of Cla-Val e-products that optimize waterworks distribution systems and enhance valve performance. 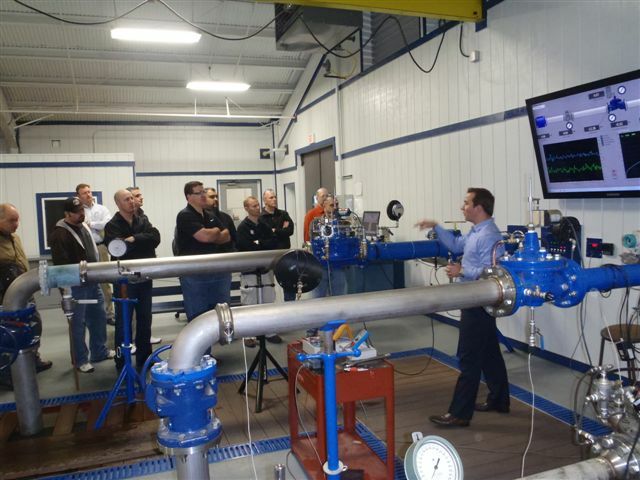 Why Product Training is a Must for Water System Operators! Having Operation and Maintenance Personnel who have been properly trained on the use and care of automatic control valves can be the difference between having a highly efficient water distribution system and one that fails to live up to the needs of the consumer and the water company. It is especially important that the training includes plenty of hands-on time so that students become comfortable and proficient at servicing the control valves in their systems. 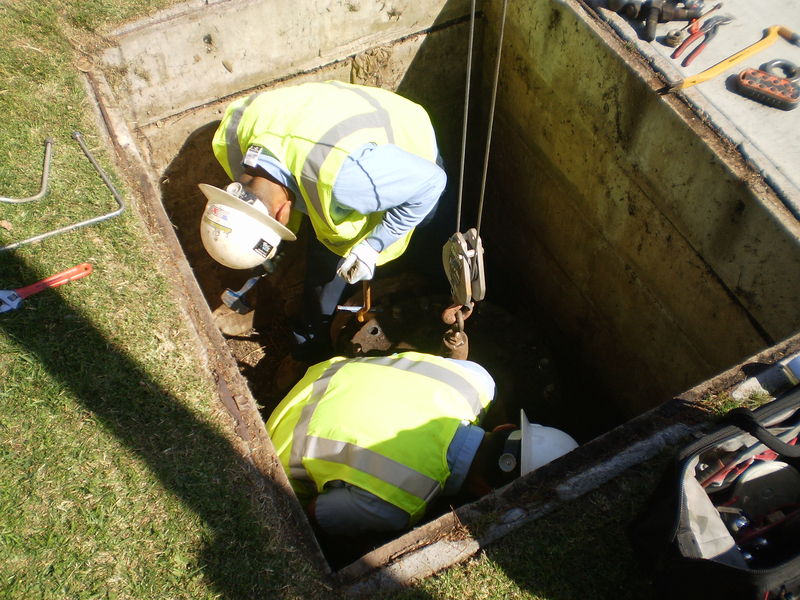 From a management perspective, having Operations & Maintenance Personnel who do their jobs well is a key part of running an efficient water system and results in improved performance and greater equipment longevity – two goals that are likely to be at the top of the list for most water districts managers. Where Can You Go to Get Control Valve Training? Product manufacturers provide the best training and some even offer training at their factories. Attending factory training is a worthwhile experience! Most control valve manufacturers have been around for several decades and have significant water industry experience. They know their products better than anyone else. They are accustomed to solving problems and know ways to prevent common issues from arising by making simple changes to basic valves. Imparting this special knowledge to their students goes a long way in ensuring that they leave with the skills to do their job at a higher level than before. What kind of training activities the manufacturer uses makes a big difference between adequate and excellent product training. Aside from classrooms and PowerPoint presentations, taking students on a factory tour, featuring the machining and assembly of the control valves, creates a greater familiarity with the components they will ultimately service or replace: seats, discs, diaphragms and pilot system components, etc. The opportunity to disassemble and reassemble a control valve and pilot system is the single best technique that can be used in product training. The manufacturer should have workstations where students can put into action what they have learned during the presentation and discussion portion of the product training. A working pump and pipeline with control valves in simulated fluid control applications is the best scenario in which to teach students how to adjust and troubleshoot control valves in the field. At the successful completion of the product training, students are typically recognized for their participation either by receiving a Certificate of Completion or a Certificate of Continuing Education Units (CEUs.) Receiving “credit” is great but the best result of excellent product training is a having Operations and Maintenance personnel who are confident and proficient in their ability to operate and service the control valves in their water system. Cla-Val is a leading global manufacturer of automatic control valves, serving waterworks, fire protection, aviation ground fueling and marine markets around the world. Please visit our website for more information or find us on LinkedIn, Twitter & Facebook.